“I’m a little more successful than I thought I would be," he says, on reaching the six-decade milestone as a writer. Bond, 77, was first published in August 1951 when The Illustrated Weekly of India carried his short story My Calling. The unassuming author, born to Anglo-Indian parents in Kasauli, has all he wished for: a home in the hills, a loving family which looks after him, thousands of books, pen and paper and an income from the royalties he receives from the sale of his books. Bond has published more than 80 titles, many of which are still in print. “I belong to the middle class, no, the upper-working class gentry," he says. “I’ve been congratulated as the author of Kipling’s The Jungle Book and occasionally mistaken for Enid Blyton," says Bond. “I’ve also been believed to be Jim Corbett. Can’t believe that I shot so many tigers!" Once a proud parent brought his little boy to Bond’s house and requested him to autograph their copy of “his great book", The Adventures of Tom Sawyer. Bond signed as Mark Twain. Bond’s cottage, built circa 1860s, is like his writing: elemental and homely. The walls are made of rocks from the hills. The ceilings are of wood. The small drawing room is filled with books and awards. A single lamp casts a dim glow on the shelves, which are stacked with detective books such as Tales of Suspense, Dread and Delight, Victorian Ghost Stories and Great Cases of Scotland Yard. Emily Bronte and P.G. Wodehouse sit next to a red hardbound edition of David Copperfield, Bond’s favourite novel. Ahmedabad-based author Esther David’s The Book of Esther, which he is currently reading, is on the chair. “It is unpretentious and has got a nice feeling of family history done in the form of a novel." “My room is like a railway compartment," says Bond, whose early stories were set in trains. “When there is a storm, the room is like a ship in a stormy sea." Pointing to the door, he says, “This is my computer." On it are pasted paper scraps of publishers’ phone numbers and cuttings of book reviews. A steel trunk below the bed has some of Bond’s most treasured possessions: old issues of the Indian State Railways magazine, The Madras Mail newspaper, and the first edition of The Room on the Roof, his first novel. The light spray of the day’s unexpected rain wets us as Bond opens a window. Waving at the forested slopes, he says: “All these are oak trees, and the winding road down there is going towards Badrinath." Closing the windows, he says, “I spend a lot of time gazing at this view: the sky above, the hills before me and the garbage dump below. In the night, I can see the twinkling lights of the Doon Valley." Bond wakes up daily at 5. From his bed, he watches the dawn breaking through the hills and the sky turning to a light blue. When the first rays of the sun fall on his bed, he goes to sleep again for another hour. His breakfast consists of toast with butter, cheese, marmalade, or parathas with pickles. “As you can see, I don’t diet," says Bond, who has a weakness for fish curry and mutton koftas. “I eat all the things I like. That is the secret of my happiness." Walking alone, his black umbrella swaying in the rainy breeze, Bond’s visage looks as bleak as his childhood years, which he described in his memoirs, Scenes from a Writer’s Life. “I have fallen in love off and on over the years," he says. “My last intense romantic affair took place in the 1960s with a very sweet-natured woman. It would take a book to describe her." Like most people close to Bond, the woman was not fond of reading. “She now lives somewhere in the wilds of Delhi," he says. The autograph queue for Bond at this year’s Jaipur Literature Festival was longer than the queues for J.M. Coetzee, Vikram Seth and Candace Bushnell put together. Yet he has rarely used his influence to shape opinions about the issues of the times. We don’t know what he thinks about, say, Maoist violence or religious extremism. 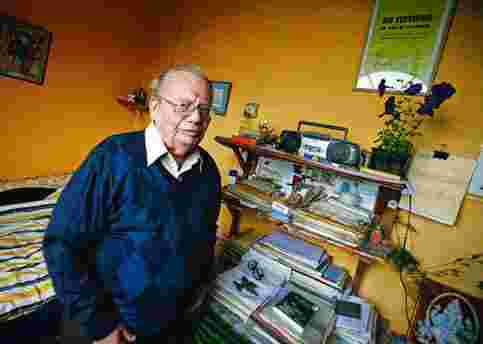 “I’m an Indian by birth and lifestyle but others look upon me as an outsider," says the man whose last visit abroad was to London in the 1950s. “So I don’t want to impose my views on others." In an introduction to one of his books, Bond, saddened by riots in the 1990s in curfew-struck Mussoorie, wrote, “Confined to the house, we must finally spend more time with our families, our children; try to reassure them that the world is not such a bad place after all." In Bond’s books, at least, it is not. Although his style has changed from merely romantic to being romantic with a cynical edge, his subjects are still apolitical. Will Bond ever retire? “Writers don’t get provident funds or pensions," he says, “so we can’t afford to retire." Does Mussoorie’s living landmark consider himself a great author? Looking at the misty flatlands of Doon, he says: “I recently went to a school where a teacher asked a little girl what she thinks of Mr Bond. The girl thought a lot, looked up and down at me and said, ‘Sir, you are not a bad writer."